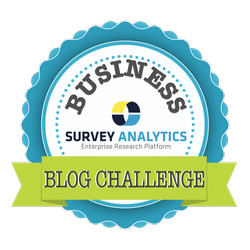 SurveyAnalytics Blog: Day 15: Describe Your Ideal Customers or "Buyer Personas"
Day 15: Describe Your Ideal Customers or "Buyer Personas"
Buyers and their behaviors are really beginning to shift in today's connected landscape. That's one of the reasons why buyer personas are becoming more important than ever to effectively sell your products and services. We have customers today in over 15 countries and 30 industries. Our business model is not a "one size fits all" solution and we serve customized options to everyone from students, to startups, to Fortune 100 companies in deploying various research methodologies on multiple scales and channels. The application of our tools is such a wide variety, but with some research into all of our customers and prospects, we were able to slim down to eight types of people, scenarios or "personas" that are most likely to work with us and form long-term, strong partnerships - no matter what industry they work in or what country they are based out of. If you, yes you, reading this right now fall into one of these scenarios, contact us and let's explore how we can pull our strengths and work together! We are open to try new things and meet you in the middle somewhere, always. The market research firm often offers full service research services for consumer trends, brand awareness, market share or pricing to help your business understand, take action and grow. They often are focused heavily on our panel management software tools and advanced analytics capabilities to filter through the data and deliver the appropriate information to clients. One of our rockstar market research firm customers is mindsight and we have a very strong partnership with them and provide the technology behind their survey tool, Opinion It. They are using our panel management software to it's fullest both online and mobile to manage many different panels to gather quick opinions, reviews and more on consumer products/services from the right target audience. The market researcher or research manager is often in charge of quantitative research in their organization. They also often pack a lot of industry experience in market research and business intelligence (at a minimum, 5 years) and are very well versed and knowledgeable of many market research methodologies. They often already have something in place that they built in house to collect feedback, however they are looking to speed up the process and make things more efficient. Cedar Fair is one of our customers that are able to quickly gather daily real-time information using SurveyPocket at over 10 parks across the country, have separate customized dashboards, run quick cross tabulations and analyze trends. The user experience researcher is often heavily involved with qualitative research for the organization. Having a tool to effectively manage a panel is very important to measuring and improving the user experience and being able to reward users appropriately for their feedback. They need tools to maximize efficiency and streamline feedback collection processes, painlessly so they can spend more time analyzing and acting on the information. They often are a senior level employee with at least 10 years of experience and very tech savvy working for SaaS, gaming, social media or software development organizations. Zynga is a customer of ours using our tools to capture the user experience. Read a recent Q&A with Zynga Panel Operations Manager, Jeanne Chinn here. The tech guru that works with us is the most often involved in product design, innovation and/or IT operations. They are very integration focused, need the ability for customization, and developer tools such as our API and mobile feedback SDK. They often design the entire infrastructure behind the user experience and are focused on the centralization of accessible information. Security and stability are also very important to their selection process in choosing a provider. They have a lot of pieces to put together and need to connect information coming from multiple places and platforms. A client of ours that captures feedback across their mobile apps and taking advantage of integrated points and rewards using our SDK in the UK is Mobilus. Research consultants that work with us are often very advanced in market research across the board and need the highest quality of information to deliver. They handle the entire process from the methodology, to design, the tool used to very specific analysis of the information all on their own. Things like text analytics are important for them to catch even the smallest details in the data. Everything from consumer insights to social research, research consultants need a tool that can handle it, work at their speed and be scalable, yet still complex. Natural Acumen is a client of ours based out of Australia that provides specialist services in social and market research on a project specific basis. They also abide to be compliant with all of the data privacy and security regulations for all of their clients. Market insights professionals are very focused on the VOC (Voice of Customer) research and collect information on consumer interactions for a large brand. Their main goal is to collect insights to keep or gain a competitive edge and deliver a more personalized experience from the brand. A market insights professional often already has an organically built list or has acquired sample and is often looking for great survey functionality, easy user-friendly programing and the option to build a community for future segmentation/smart targeting. We have been working with Potbelly to help their insights manager launch a community to manage, research and deliver information on current customers from over 200 stores across the country. The startups and innovators like to think outside of the box for the use case of our tools. They are often looking at building solutions and making additions to fit into their specific environment (and grow). They are often a former enterprise manager and now founder or President of a brand new startup or they work for a very forward thinking large innovative company looking to try something new. This can be anything from collecting feedback on possible business product and service offerings, to A/B testing and experimentation with advertising, marketing messages, videos and more to find what will stick. An example of an innovative client that brought SurveyPocket into the blue sky (literally) is Thales. We have customized SurveyPocket to run in their Android seat backs to run in-flight passenger surveys in 22 different languages. The customers we work with in education are broken into three tiers. The first is the students that need to use our tools for a small, simple project for a class all the way up to students going for a Ph.D that need complex functionality. We offer a student discount for student projects, too! Second, we work with faculty that is looking for a department wide license for students in a specific class to use and/or their own department research initiatives. Third, we work with universities as a whole to provide a university site license for all feedback initiatives at the university. Education customers are most often after user-friendly functionality, easy to learn software and a smooth implementation. One of our most innovative education customers is the Department of Population Health Sciences at the University of Wisconsin Madison. OutSmart Flu is their initiative to monitor real-time flu activity on the campus through a mobile application and crowdsourcing approach for recruiting and encouraging students and faculty to respond.